As general contractors that cater to the entire Central Alberta area we get inquiries about industrial builds in and around Red Deer. There are many nuances that come with the industrial sector of the region, things that only those close to the process will know. While we are happy to answer any questions that you have from the get-go (contact us here) we thought we’d provide you with information on key elements that will directly apply to your prospective construction project. I1 Industrial (Business Service) District – This district is relegated to light industrial builds, warehouses, storage, and services that support industrial operations. Industrial enterprises in this district will not generate noises, emit odours, nor expel dust, fumes or any other element that can be considered a nuisance to neighbouring businesses and residences. I1 also provides a base of operations for businesses that do not quite meet the criteria and guidelines of the city’s commercial districts. Examples of permitted-use include operations that provide accessory sales related to manufacturing/processing/distribution and accessory sales of used vehicles when limited to no more than three units, on the site, at any given time. Examples of discretionary-use include auction marts (non-livestock), industrial trade schools, and the sale of large trucks (over 10,000 kg) and heavy construction equipment/machinery. If you think that your build may fit within this district and have further questions please call 403-887-2291. Eco-Industrial District – This extension of I1 serves as Red Deer’s shining example of sustainable industrial development. The district mandates environmentally conscious waste reduction and efficient resource use. Construction in this zone should follow suit. Tenant candidates include alternative/renewable energy facilities. If you think that your build may fit within this district and have further questions please call 403-887-2291. I2 Industrial (Heavy Industrial) District – This district is relegated to a wide range of manufacturing, assembling, and fabrication operations in addition to the processing of goods. The permitted-uses of I1 apply to I2 as well, with the exception of industrial support services. Discretionary-uses of I2 include auction marts (including livestock, contrary to I1) and alternative medical facilities. If you think that your build may fit within this district and have further questions please call 403-887-2291. I1A/BSR (Light Industrial / Business Service-Residential) District – This district is relegated to the future redevelopment of industrial sites. Industrial builds occurring in this zone will be compatible with new neighboring commercial and residential developments. Industrial operations will complement these burgeoning developments, and contribute to the enhanced quality of life. Industrial construction must fall under the guidelines set forth by the Riverside Meadows Area Redevelopment Plan. Permitted uses include industrial support services. Discretionary uses include professional and medical offices, industrial trade schools, and show homes. Regulations in this district are more stringent given the proximity to Riverside Meadows, so if you think that your build may fit the criteria we encourage you to first call 403-887-2291. Noise emission – operations must not result in noise that is audible at any point on the boundary of the industrial lot. Smoke emission – operations must not result in smoke, outside of the relegated use of waste disposal incinerators (as approved by the Red Deer Development Authority), that is notable at any point on and outside of the boundary of the industrial lot. Dust/particle emission – operations must not result in the expelling of dust, ash or any other obtrusive particles. Odour/gas emission – operations must not result in the expelling of odours, gas or any other obtrusive scent. Toxic emission – operations must not result in the expelling of toxic gases or toxic substances. Glare and heat production – operations must not result in obtrusive glare or unreasonable levels of heat beyond any point on the boundary of the industrial lot. Outdoor storage conditions – outdoor storage is permitted if kept neat, safe, and in an orderly manner. Red Deer Utility ByLaw regarding waste – waste that is intended to be discharged into the sewage system must abide by Red Deer’s Utility Bylaw. Industrial building front – In addition to being well-kept (gravel, paving, landscaping) the “front yard” of any industrial build in Red Deer may only be used for i) pedestrian walkways and landscaping, which must equal no less than 40% of the area ii) driveways with access to streets as approved by the Red Deer Commission iii) parking (and loading), which must not exceed 60% of the area, with the requirement that vehicles can enter and exit the lot without reversing or unreasonable navigation, and iv) displays, provided that the exhibition is approved by the Red Deer Development Authority. Projection over building yard – No construction shall allow any portion of the industrial building to excessively project into a minimum yard setback, unless i) the canopy is a minimum 3.6 metres above the surface of the yard, and ii) no supports or posts are assembled on the yard under the portion of the projecting canopy. Vehicle access to parking lots from public roads – Engineering Standards will dictate location and number of proposed entrances and exits to and from the industrial development. Outdoor Storage – Outdoor storage (when permitted) on industrial sites must i) be reasonably concealed from view from neighbouring sites and roads by a fence or wall (determined by Red Deer Development Authority) ii) not be located within the front yard setback of any industrial build, and iii) comply with outdoor display or sale of goods regulations when lumber yards on site have been approved. 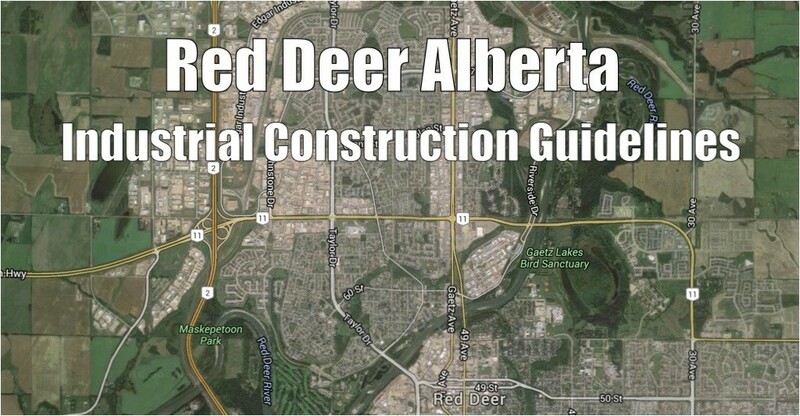 There is of course much more to know about industrial construction (or renovation) in Red Deer, but the above is a great start. For the rest, contact Apple Building Systems – your ultimate guide to construction in Red Deer Alberta.